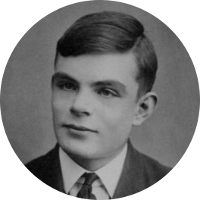 Alan Turing was an English mathematician, cryptanalyst, and computer scientist. He is often referred to as the father of theoretical computer science and artificial intelligence. During World War II, Alan Turing joined a secret code breaking unit based at Bletchley Park. He was instrumental in developing a machine that was able to find the settings used by the German Enigma machine enabling the allies to decrypt German messages. It’s been estimated that this accomplishment, the subject of the 2014 movie The Imitation Game, shortened the war by a couple of years and saved millions of lives. Alan Turing’s known famous kin tend to be through royal connections. He is a direct descendant of King Edward I and a number of Magna Carta sureties including Hugh le Bigod, John FitzRobert, Sir Saher de Quincy, and Henry de Bohun. One of Alan Turing’s more interesting connections is a kinship to actor Benedict Cumberbatch. Cumberbatch is the actor who portrayed Turing in the movie The Imitation Game. Another interesting family connection for Alan Turing is to German rocket scientist Wernher von Braun. Not only did Braun help develop the United States’ Saturn V rocket that propelled the Apollo spacecraft to the moon, but Braun also helped develop the German V-2 rocket which killed thousands of British and Belgian citizens during the war.